When first performed,?Relatively Speaking?was described as “a superbly constructed …play that gave its audiences total and continuous delight, and established Alan Ayckbourn as the brightest new comic talent in the theatre”. Nearly forty years on, the play is as fresh and as funny as when it was first seen. Ginny has just ended an affair with an older man (Philip) and is now engaged to Greg. But Philip won’t take no for an answer so she visits him at his home to end it once and for all. But Greg, thinking she is visiting her parents, decides to surprise her and goes there himself. Meeting Philip’s wife, Sheila, he assumes she is Ginny’s mum; Philip thinks Greg is his wife?s young lover? Opportunities for comic misunderstandings and confusion abound and Ayckbourn handles them with consummate skill. A classic Ayckbourn not to be missed. 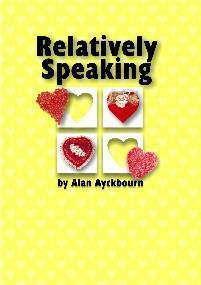 WHILE I am far from being an Alan Ayckbourn addict - I find too many of his plays far too similar - I have to hold up my hands and say?Relatively Speaking?is absolutely brilliant. A series of misunderstandings set in motion a hilarious chain of events, and there are some clever twists along the way. It's hard to believe that this is Bryn Thomas's debut as a director, because this Altrincham Garrick production looks and sounds like it has been directed by a seasoned professional. Everything is spot on - from the pace to the delivery of the actors. Not a word is wasted. Hugh Everett clocks up 20 years as a Garrick member next year and his performance as the ranting and ridiculous Philip is, for my money, one of his best yet. His face was a picture when Ginny turns up at his home, a microcosm of middle England, to tell him, once and for all, that their affair is over. The trouble is, Ginny's fiance Greg has also turned up at the same house, believing it to be the home of her parents, parents he's never met. Neeraj Pathak, making only his second appearance at the Garrick, is confident and charismatic as Greg, and I'm sure I'm not the only one who can't wait to see more of him on stage. The society has landed a prize catch with this young actor, and future roles are sure to come thick and fast. Pam Nolan gives a beautifully controlled performance as Philip's long suffering wife Sheila and Stephanie Hawthorn is equally impressive as Ginny. But this is really the Hugh Everett Show and if you think his face is a picture when Ginny turns up on his doorstep, just wait until he's tricked into sending his "daughter" around Europe on her honeymoon. He gets so worked up I thought his head was going to explode. This is great fun - do not miss it.